Proper maintenance of your standby generator is crucial to its life expectancy. After your installation, you will see us again regularly over the lifetime of your backup generator system. We are generator maintenance specialists and can provide full repair to all types and brands of backup power generators, commercial as well as residential. We have many financing plans and excellent warranties to offer our valued customers. Your home or business backup generator systems will need preventative maintenance at regular intervals in order to keep it running its best. By scheduling routine generator maintenance and servicing, you can extend the life of your system and ensure its reliability. You can count on our trained and certified power consultants to perform generator maintenance, generator servicing, generator repairs, and upgrades as needed. We also provide 24/7 emergency generator service for all types of generators. We can help you with diesel generators, natural-gas generators, portable generators, gasoline generators, and liquid propane generators. We offer preventative generator maintenance programs, including a two visit or four visit program where a power consultant checks in every six months. During the visit, we will perform an engine oil and filter change voltage testing, adjustment of circuits (as needed), and inspection of: hoses, belts, connections and battery. 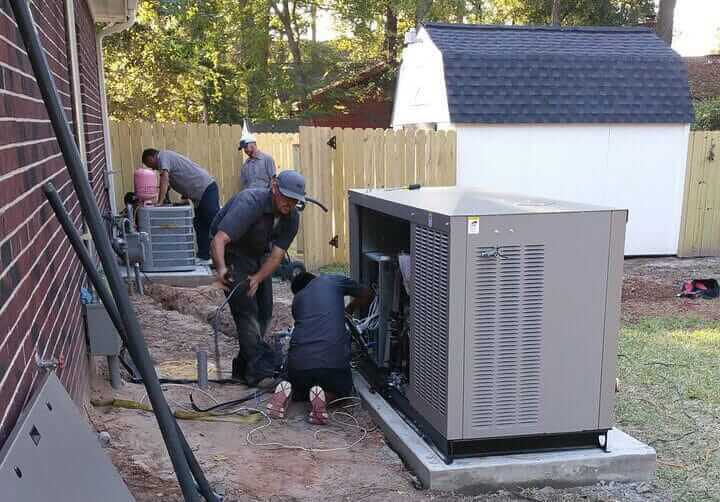 ARK Generator Services will clean the interior and exterior of the generator enclosure. Having a well-maintained generator system is peace of mind that lasts years. ARK Generator Services can provide products and additional services to monitor your generator. ARK Generator Services offers home owners the technology to monitor their power generator for its regular start checks and diagnostically monitor vibrations in the generator for weaknesses, maintenance schedules and identify service disruptions around the clock 24/7. Our monitoring service registers any minor vibration variations from within the generator motor which are signs of some maintenance or repair needed. Preventative adjustments are made prior to a disruption of expected or needed service. Every home owner can rest assured they have an added level of protection and peace of mind knowing that the experts are monitoring the well-being of their backup power generator. Our standby generator monitoring service is especially beneficial for those who own a second home, rental property or vacation home but live elsewhere. This service can now be added to any existing standby generator as well. If you would like to have monitoring a backup generator or know someone who could use their generator monitored more than every six months, please do not hesitate and leave your investment unattended, call us today or ask to have an ARK Generator Services Power Consultant provide you with all the details regarding our backup generator monitoring service.